The Fraud Squad, who investigate and press charges in cases involving economic and international crime, are now for the first time involved in a case of attempted match fixing in tennis. It happened in the late summer at Futures tournaments, the lowest tennis level, held in Aarhus and Copenhagen. The Deputy General State Prosecutor Per Fiig has stated that the State Attorney for Special Economic Crimes and International Criminality has found cause to start an investigation, but at the moment cannot say anything about the current investigation. The Danish daily Politiken had a story earlier that there was an attempt to bribe with large sums of money tennis players to lose a set on purpose. Berlingske can now publish details in the case, such as how the match fixers went about it. “It’s gratifying the the Danish prosecutors are looking at the case. I’m looking forward to what might happen. I’m very satisfied that this is being taken seriously because the problem won’t disappear on its own,” says Sune Irgens Alenkær, who is a director of the Danish Tennis Association (DTA). The Danish Athletic Association (DAA) is also gratified by the news that the Fraud Squad is interested in the case. “It’s super positive. It hasn’t been pleasant to see that there have been foreign match fixers willing to operate in Denmark in connexion with competitions. Because everything points to it being foreign match fixers, we haven’t, as a Danish association, had jurisdiction over it, so we couldn’t investigate the case directly. If the police have taken up the case, we can only welcome it,” says Jesper Frigast Larsen, who is head of the DAAs Match Fixing Committee. The Danish Tennis Association, who arranged the tournament together with Århus 1900 and Copenhagen’s Ball Club, have since the late summer been unable to gain any insight into where the case stands. The International Tennis Federation’s (ITF) own investigative arm, the Tennis Integrity Unit (TIU) gathered evidence in the form of e-mails, Facebook messages and text messages. The Danish association has since been kept in the dark of it’s own parent organisation, which, despite numerous enquiries, hasn’t found time to meet with the DTA. Berlingske has been in contact with several of the tennis players who all tell the same story: they were offered around 30,000 Danish Crowns ($4,500 US) to lose a set, but they haven’t heard from either the TIU or the Danish police about making statements. They handed over all evidence to an ITF supervisor who was at the tournament. But the German supervisor, Nico Naeve, has been muzzled, he wrote in an e-mail to Berlingske. Asked directly what the status of the Danish case was, the TIU answered: “We are aware of the accusations at the tournaments in Denmark, but we cannot answer specific questions,” they wrote. The Danish Athletic Association understands that there needs to be quiet about ongoing investigations, but “clamming up” isn’t the way forward. No thank you. 30,000 Danish Crowns doesn’t sound like the kind of money you’d want to risk your career for. But for constantly travelling tennis players, the offer can help pay the expensive travel costs, point out players who said no to the offer. Do you need 30,000 crowns? That was the question upwards of 30 tennis players were asked when they took part in a tennis tournament – a tournament at the lowest professional level – in Aarhus and Copenhagen respectively in the late summer. 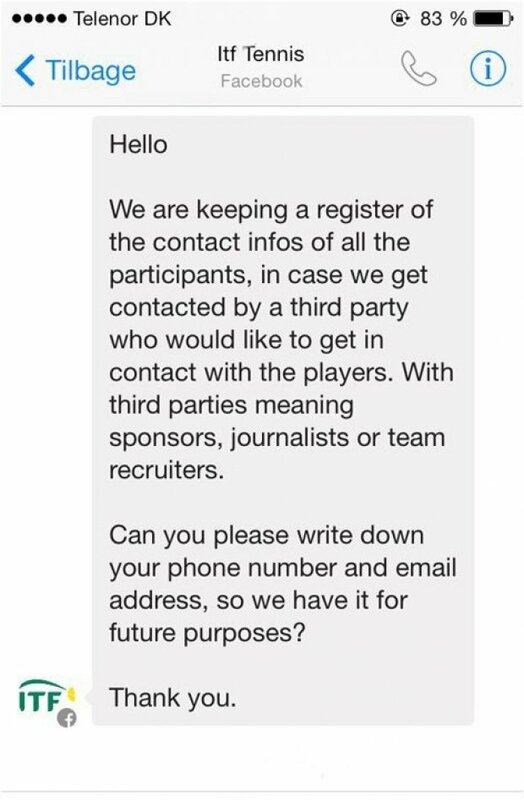 The person or persons behind the offers contacted the players by text message, by e-mail or by Facebook and wrote in English that they didn’t need to lose the match. Just one set would be rewarded with €4,000, the equivalent of around 30,000 Crowns. “I’m your contact person, and I can meet you in person in Copenhagen to give you a deposit of €2,000 today, you will get the rest after the job is done,” was the message. €4,000 is a large sum in a competition where the women’s winner got $1,568 and the men’s got $2,160. Benjamin Hannested accepted the friend request and gave his details. “When I got the friend request, I thought it was part of a process for when you play for money. I could see that several I knew had accepted the request,” he says. Benjamin would get €2,000 before the match and another €2,000 “after the job is done”. A contact person in Copenhagen would give him the money. “There was no chance I would say yes to the money. That’s not like me at all. I was very surprised to put it mildly. Even though I’d heard it could happen, it was still crazy that I’d get this offer in my first tournament as a senior,” says Benjamin Hannestad, who reported the matter to the TIU, the International Tennis Federation’s investigative unit. But other tennis players at the same level might be tempted. Seniors at the lowest levels struggle to raise the money to travel to tournaments around the world, and the money should be seen in that light. And if you don’t have a big-money sponsor behind you, match fixing can be tempting, says Jens Sejer Andersen, international head of the Play The Game initiative. “Tennis is a sport a lot of semi and quarter professionals play. There are few who earn big money, while there are many who try. There can be lots of older seniors who can’t earn a living elsewhere and perhaps feel that tennis is possibly their best chance. Maybe after a few years they get fatigued and develop a certain cynicism and vulnerability to “the good offer”,” he says. While match fixing in football/soccer requires that at least goal keeper, a defender and an attacker agree to play according to an agreed pattern, tennis is different. All individual sorts, all things being equal, are more vulnerable to match fixing. All that’s needed in tennis are a few balls into the net. The women’s winner of the Futures tournament, Mai Grage, also received the offer to lose a set on purpose. She didn’t answer the friend request from the fake profile. She figured out the profile was fake because they had no common friends. “You hear about match fixing at higher levels, but I was very surprised to hear about it at the lowest international level,” she says.